Powers/Abilities: Considered a master military strategist, Adolf Hitler behaved like a coward and a blowhard. He possessed a handgun that was able to pierce powerful mystic defenses. (Dr. Strange II#51 (fb)/Doctor Strange: Sorcerer Supreme#7/2 (fb) ) - <1918> In his youth, Hitler met with Heinrich Krowler, a powerful black magician, who introduced him to his cabal of fellow mystics. Krowler and his allies helped fund Hitler's rise to power, sensing the chaos he would bring. The meeting took place in the Bavarian Castle Krowler and Krowler asked his friends to give Hitler their moral and financial support. (Hellstorm#16, 18 (fb) - BTS) - The nefarious Chapel of Dresden, a group of occult psychopaths allegedly once closely associated with Hitler, may have been among these mystics. They sought to breed a new high priest and priestess: Half human, half hell--messiahs from the pit, to lead the Chapel into a new century as rulers of men. (Red Skull I#1) - <November, 1923> Hitler marched through Munich with the Nazi Party to seize power in the city, but the police confronted them and they had to flee. A young Johann Shmidt witnessed Hitler being brought to safety in a car. (Daring Mystery Comics#6) - In 1926, in Valhalla, the soul of a hero known as Hercules observed visions of Hitler's rise to power in Germany and the threat that he will pose to the world. Hercules petitioned Jupiter, ruler of Valhalla, to allow him to be reincarnated in America so as to eventually be able to oppose the Axis forces. Jupiter consented, and Hercules's spirit entered newborn baby Martin Burns. Fourteen years later, young Martin, superhumanly strong thanks to the presence of Hercules's spirit in his body, became the teenage hero known as Marvel Boy. (Monsters Unleashed#6/6) - In the 1700's the Countess Von Schmidt became a wolf after drinking water from the Harz mountains area. Hitler ordered that his "wolf pack" would carry at all times a canteen of this water. (Invaders I#36 (fb)) - In 1932, as Hitler led the Nazi party to "unite all Germany", two friends, Helmut Gruler and Franz Schneider observed his rise. Gruler was optimistic, but Schneider believed Hitler was insane, and finally fled to America. (Red Skull I#3) - <February 27th, 1933> The Reichstag was set on fire by Dutch leftist Marinus van der Lubbe. Reich Chancellor Hitler and Reich Minister Göring called it the beginning of an organized Communist uprising. Nazi Brownshirts helped in the search for Communists. Thousands were arrested. <March 5th, 1933> At the elections the Nazis won 44 percent of the votes. The Communists won 12 percent, but all of its deputies were arrested and jailed. <March 23rd, 1933> The Reichstag passed the Enabling Act, which vested the power to make laws to Reich Chancellor Hitler. The same month concentration camp Dachau was established. <June 21st, 1933> The Social Democratic Party was banned. 3000 members were arrested and 91 murdered. By the end of the year 130,000 Communists have been arrested and 2500 murdered. Between January and May of 1933 1.6 million Germans joined the Nazi Party. (Red Skull I#4) - <September, 1933> Hitler with Ernst Röhm at his side gave a speech in Nürnberg in front of the S.S., S.A. and other NSDAP party members. (Red Skull I#5) <June 29th, 1934> Hitler and members of the Gestapo met with Ernst Röhm at the Bad Wiessee thirty miles south of Munich. Hitler ordered to immediately execute Röm's men then confronted Röhm himself and had him arrested. Johann Shmidt, posing as a bellboy, and his Communist childhood friend Dieter Lehmann planned to assassinate Hitler, but when Lehmann pulled the gun on Hitler Shmidt turned on him and after disarming him shot Dieter in the head. (Tales Of Suspense I#66/2 (fb) ) - In 1934, on the evening that Hitler took power in Germany, he happened to be chewing out his Gestapo chief for letting a spy escape. Seeing the young bellboy, Johann Shmidt, he claimed he could teach him to do a better job than him. But then, looking into his eyes, Hitler realized he could make a powerful ally of him. He turned him over for training, but was despaired when his men trained him as a storm trooper. (Thunderbolts Presents: Zemo - Born Better#3-4) - Hitler attended a test of Heinrich Zemo's death-ray, with Johann Shmidt as his bodyguard. Also in attendence was Abraham Erskine, who attempted to persuade Hitler to employ his serums, but Hitler refused to consider using chemical enhancements on his men. (Tales of Suspense I#66/2) - Hitler ultimately sought to make Shmidt a unique identity for his protégé, and he placed upon him the mantle of the Red Skull. His first order was for him to kill his instructor, but instead, the Skull let the man live and fear him. (Marvel: The Lost Generation#5 (fb)) - In his early days, Hitler was secretly aided by the Rumor, who used his abilities to enthrall others to subvert crowds to the Nazi cause. After the Rumor vanished following a scuffle with Robert William Paine, he was believed dead. (Wolverine II#19 (fb) ) - At some point after 1936 Geist became part of Hitler's Inner Circle. (Blaze II#9 (fb) - BTS) - In 1938 after Austria joined the Third Reich Hitler granted the Kristall Starrer 10,000 Reichsmark for his research. (Marvel Two-In-One Annual#1 (fb)) - Before 1939, the man who would become Skyshark was a skilled pilot and killer. He joined his two talents when he became Captain and piloted a stuka in the Luftwaffe (the World War II German Air Force). He was cruel, as he shot to every civilian he saw from his airplane. This attracted' the Fuhrer's attention on him, so the Fuhrer named him Himmel Hai (Skyshark) and ordered him to create a squadron to attack the USA country. (Sub-Mariner Comics 70th Anniversary Special#1/2) - <At some point in 1939> Namor destroyed an entire Nazi installation on an island in the South Pacific, which enraged Hitler because it set back the Vergeltungswaffe program for years. (Life of Pope John Paul II) - On September 1, 1939, Hitler ordered the attack on Poland. (Master of Kung Fu I#23 (fb)) - In 1940, Wilhelm Bucher vocally spoke out against the alliance with Japan, but was forced by Hitler to accept a Japanese assistant on a mission to deliver secret documents to Japan. Bucher was ultimately abandoned by his "ally". (Daring Mystery Comics#8) - In May, 1940, Hitler spoke via radio to Nazi troops in France, ordering them to "wipe out the Belgians and Dutch." Weeks later, British soldier Lt. John Watkins, who had been among the British troops to oppose the Nazis and had briefly been believed killed in action, adopted the identity of Citizen V and began harassing German forces in occupied France. Citizen V subsequently moved his operations to Germany, where, disguised as a German soldier, he confronted Hitler, punched him in the face, and left a "V" calling card before departing. (Captain America Comics#2/2) - Hitler arranged to have an American financier, Henry Baldwin, kidnapped and brought to Germany and replaced him with a double. Apparently Baldwin was so rich, his fortune could save England. "The fate of the world depends on Britain's victory...the fate of Britain rests on the financial aid of our own Henry Baldwin." Hitler: "The whole world expects you to sign the pact mit Britain...dot in turn vill cause der rest of Europe to fall in line mit der democracies, but---you vill not sign der pact!! Instead you vill sign mit Mussolini! Dot vill swerve Europe to our side--leaving democracies trapped!" Due to Bucky's eagle-eye, the double was spotted and stopped before signing the pact with the Axis. Hitler then ordered the real Baldwin to be executed by an extremely large cannon. Cap and Bucky prevented the execution because they were hiding in the cannon and rescue Baldwin. "You get the big one, Adolph, I'll get the little guy." "No, Hermann. I'll get the little guy!" Bucky then dropkicked both of them. The R.A.F. flew into Germany and rescued Cap, Bucky, and Baldwin. (Sub-Mariner Comics#1) - Hitler determined the Nazi war machine had been assaulted by the Sub-Mariner too many times and ordered a fleet of U-boats to destroy Namor's home city, Atlantis. Emperor Thakorr was struck unconscious in the assault, putting Namor on the throne; he responded to Hitler's attack by re-building Atlantis' fleet to take on Germany itself. (Saga of the Sub-Mariner#2) - Hitler postponed Operation Barbarossa, the surprise assault on the Soviets, until June 22nd, 1941 due to the attack on Atlantis. 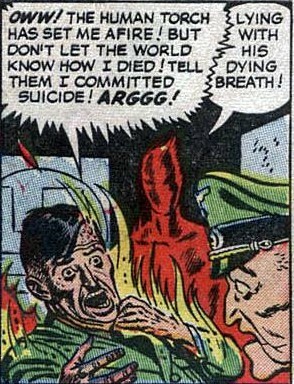 (Mystic Comics#5/8) - Captured by the Nazis the Blazing Skull was tortured. Hitler was infuriated when Todd told him that he would be defeated and ordered his execution the next morning, but Todd escaped during the night. (All-Winners Comics#1/3) - Hitler checked in with his agent, the Lord of Death, who had been sending armies of zombies on rampages. To his surprise, he found himself speaking to Captain America and Bucky, who had already defeated the Lord of Death. Bucky gave Hitler a raspberry before the transmission ended. (Young Allies#1/2) - While in Berlin, Hitler encountered members of the Young Allies, who he patted on the head, believing them to be "good German boys." The Young Allies went on to infiltrate the lair of the Red Skull by masquerading as the Red Skull himself. When Hitler came to check in with the Red Skull, the Red Skull and his men tackled him, thinking the Young Allies were playing another trick. They were mortified to learn their mistake. (USA Comics#1/3) - Hitler threatened his Fifth Columnists would destroy America from within. (All-Winners Comics#2/3) - Hitler ordered pilot Rudolf Hess to drop the Black Plague Bomb in the heart of London, but the Destroyer replaced the bomb with a fake one and then escaped Hitler and his cronies. (Human Torch Comics#5b) - Hitler observed the Sub-Mariner's renewed war against humanity and battle with the Human Torch, while planning his offensive on the Russian Front. (Mystic Comics#7/1) - Even though Wilhelm von Sin had just failed to sink a ship as ordered, Hitler sent him to capture the Destroyer (Keen Marlowe). Destroyer killed Sin and destroyed several planes, depressing Hitler even further. (All-Winners Comics#3/5) - Hitler wanted something to be done about the British Royal Air Force and Doctor Dragon suggested to build an undersea tunnel to England. The Destroyer blew up the tunnel and took Doctor Dragon to England. (Captain America Comics#10/1 - BTS) - Nazi agent Countess Mara tried to steal America's only model of the new rapid fire grenade gun for Hitler, but was thwarted by Cap and Bucky. (Invaders I#17 (fb) - BTS) - At some point Brain Drain invented a special belt-apparatus that translated the user's speech into any other language and translated everything he heard into his own language...an universal translator. He built it for Adolf Hitler himself. (Marvel Two-In-One Annual#1 (fb)) - Captain Schleigal piloted a stuka in the Luftwaffe. He was cruel, as he shot every civilian he saw from his airplane. This attracted Hitler's attention, who gave him the condename Himmel Hai (Skyshark) and ordered him to create a squadron to attack the USA country. 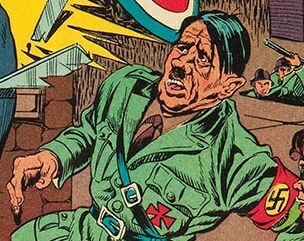 (Mystic Comics#8/3) - After the Destroyer freed a spy Hitler ordered once again his capture or else heads would roll. Herr von Maus was sent after him, but the Destroyer defeated him and pretended to be him. Posing as von Maus the Destroyer got to Hitler and humiliated him before fleeing when the guards arrived. (Captain America Comics#15/5 - BTS) - Secret Stamp's fame reached Berlin and Hitler wanted him dead, sending Grandma and her spies after him, but they failed. (USA Comics#5/1) - Hitler and Mussolini needed to find a way to hide Germany's difficulties from a visiting Hirohito, so they whisked him off to a castle in the Black Forest. The Victory Boys were nearby and confronted the three dictators nearly killing them with arrows. (All-Winners Comic#4/5) - Hitler gave Heinrich Bungler, head of the Gestapo, one more chance to catch the Destroyer or else he would be executed. He failed! (Mystic Comics#9/1) - When a speech by Hitler was interrupted by the Destroyer's Freedom Station he ordered Baron Uuh to bring him the Destroyer dead or alive. Shortly after the Freedom Station interrupted another speech the Destroyer was caught by Uuh. Delighted Hitler wanted to be present when the Destroyer gets tortured, but the Destroyer escaped and soon another speech by Hitler got interrupted by the Freedom Station. (Human Torch Comics#8/2 (fb) - BTS) - Hitler tried to call his agent the Python five times in half an hour when he got into trouble with the Human Torch, Toro and Namor. (Human Torch Comics#8/2) - Python called back to inform Hitler that he had escaped. He headed to New York the next day. (Human Torch Comics#8/3) - Adolf Hitler lamented the loss of another 25 of his best spies, due to the efforts of the Torch and Sub-Mariner, and wondered what could be done about them. Goering suggested to gain the aid of Torch's creator Professor Horton to destroy the Torch. In the meantime Goering engineered the escape of the Python from prison to deal with the superheroes. (Mystic Comics#10/1) - Hitler told Gruber that the British were destroying all their munition factories. Gruber suggested underground factories the British won't find. Hitler liked the idea until the Destroyer got wind of it and freed prisoners of war working at the underground facility, which they then destroyed. (Young Allies#5/1) - Hitler had Von Richt executed for failing to demoralize morale in America. He then sent the Owl to Hollywood to break the spirit of America from within. The Young Allies, Captain America and Human Torch thwarted the invasion plan of the Owl, who escaped. (Young Allies#6/4 - BTS) - Hitler was announced to personally inspect the students of the School of Sabotage. (Young Allies#6/4) - The Young Allies arrived on the drill grounds of the School of Sabotage in Berlin to listen with a crowd of soldiers to a speech of Adolf Hitler. Toro tossed a few fire balls at him and a fight with the soldiers erupted. They gave Hitler a beating then fled before blowing up the school. (Captain America Comics#19/5) - In Berlin Hitler oversaw the interrogation of kidnapped US General Spenser to learn the plans he was supposed to deliver to the British, but he didn't talk despite being tortured and was eventually freed by Captain America and Bucky. (Marvel Mystery Comics#37/2) - Hitler ordered Captain Kornstalk to blackmail Namor into working for the Nazis by threatening to kill his people with the copper plague. Namor destroyed the device creating the plague. (Captain America Comics#22/3) - Hitler sent the Reaper to the USA to cause an uprising against the government and all authority figures. "Und so, remember, der bigger der lie you tell, der more chance dot it vill be belived! After all, ve haff made our people believe dot dey are a superior race! Look vot a big lie dot iss! Hitler was not happy when the Reaper died and his plans were exposed by Captain America and Bucky. (Human Torch Comics#11/4) - Hitler claimed on a radio broadcast that Nazi agents led by Herr Bull Neck would bomb New York Harbor. It was actually a hoax to get the plans for the harbor defenses, but Namor thwarted Bull Neck. (All-Winners Comics#8) - Hitler met with Blucher, a Nazi agent who had recently been released from an insane asylum, and discussed with him plans for invading England. Blucher had devised a refrigeration coil which could freeze the ocean around England, allowing them to invade on ice skiffs. Hitler alerted bundists in America to capture the Human Torch and Toro so that they would not interfere, but the Torches defeated the bundists, learnt of Hitler's plans, and led the British fleet to defeat Blucher. (All-Winners Comics#8/5) - In "Hades," a demon identified as "the Devil," claiming to have put Hitler "in charge of things," grew disgusted at a report of Hitler's failure at the Russian front. The Devil's confidant, a woman called Madam Satan, suggested that Attila the Hun be relieved of his duties tormenting enslaved souls to replace Hitler; the Devil agreed, and Madam Satan brought Attila with her to Germany to meet with Hitler. Hitler, recognizing Madam Satan, was obsequicious at first but balked at the notion of surrendering power; however, Madam Satan reminded him that he had sold his soul to the Devil and bullied him into cooperation. Demonstrating her power, Madam Satan used a supernatural atomizer to transform two of Hitler's flunkies into stone. The Destroyer, having observed the arrival of Madam Satan and Attila from outside Hitler's stronghold, was moved to action by the sight of the spray's power. He broke into Hitler's office, manhandled Hitler, and fought Attila until Madam Satan managed to transform him into stone; Attila demonstrated to Hitler that heat would break the stone spell, freeing one of his petrified flunkies. Hitler had the petrified Destroyer placed as a table decoration at a banquet for his officers, but after they had fallen asleep following their carousal, the heat from a cigar partially freed the Destroyer, enabling him to move to a fireplace and be completely restored. Madam Satan and Attila the Hun both responded to his revival, but the Destroyer knocked the atomizer from Madam Satan's hand and kicked Attila into the fireplace, resulting in his return to "Hades." Madam Satan, not wishing to confront the Destroyer alone, followed Attila into the flames. The Destroyer recovered the atomizer and petrified several Nazi soldiers who were responding to the activity, then pursued a panic-stricken Hitler with the intent to petrify him. However, after the Destroyer had chased Hitler outside, a bomb dropped from an Allied air raid put a stop to his pursuit, and Hitler avoided being transformed into a statue. The Destroyer then destroyed the atomizer lest it be misused. (Captain America Comics#27/4) - Cap and Bucky were captured by Herr Wolf and brought before Hitler. They escaped Hitler's castle after Cap got a few hits in on Hitler. (Captain America Comics#28/1) - The Mad Torso offered Hitler, Mussolini and Hirohito his help to get rid of Captain America and Hitler relunctantly took his offer. He failed! (Tales of Suspense I#67/2) - Hitler was visited by the Red Skull, who showed him his captive, Captain America, who had been temporarily brainwashed to follow his commands. Hitler was pleased, and tried to strike Captain America in the face, but even under the Skull's thrall, Captain America knew enough to defend himself. (Invaders Annual#1 (fb)) - Hitler summoned Agent Axis, a combination of a Japanese, Italian, and German spy to see him, and ordered him to capture Captain America's shield so that his scientists could study and duplicate it. Hitler despised Agent Axis, and when he failed, it made little difference. (Namor the Sub-Mariner#11 (fb) ) - Hitler called Master Man the perfect son he never had and told him that even though Lohmer had failed to start a Nazi Organization in the USA to spread Hitler's ideology Lohmer had redeemed himself by volunteering for Project Ubermensch to become the Master Man. (Invaders I#16-21) - Hitler oversaw the attempted marriage of Warrior Woman and Master Man in Berlin, as well as the capture of the Invaders; however, the Invaders were spared a firing squad death by the new Union Jack, and Hitler fled, taking Captain America's shield as a trophy; he tried to escape aboard a plane, but the hero Dyna-Mite had smuggled himself aboard, and recovered the shield. Hitler parachuted to safety before Dyna-Mite could capture him. (Moon Knight I#22/2) - In October, 1942, Hitler launched an offensive at El Alamein, ordering Rommel's men to plant land mines through the desert. However, the mines ultimately failed, when a fault line opened, destroying most of the mines. The Egyptian Moon-God Khonshu apparently manipulated the fault line in order to aid in overthrowing Hitler's troops. (The Truth: Red, White & Black#6) - Pvt. Isaiah Bradley, the sole survivor of the black Super Soldier program, invaded its German counterpart, Schwatzebitte, but was captured by exposure to otherwise lethal fumes from a gas chamber. Hitler and Josef Goebbels tried to convince Bradley to turn against the USA, by pointing out how the African-Americans had been treated in America, and how the Germans/Nazis would free the African-Americans from oppression after their victory. Bradley refused, and Hitler had him sent to be tortured and castrated, to have his limbs removed, and to be sent back to the US still living in that state. However, en route, Bradley was freed by the German Resistance, and eventually made it back to the USA. (Sgt. Fury and his Howling Commandos#1) - Hitler contacted his men interrogating French resistance fighter Pierre LaBrave, and impressed upon them the importance of extracting information from LaBrave. However, LaBrave was rescued by the Howling Commandos. (Sgt. Fury and his Howling Commandos#9) - The Howling Commandos were sent on a mission to capture Hitler, which they seemingly succeeded at, only to find that the Hitler they had captured was one of his doubles. (Sgt. Fury and his Howling Commandos#14) - Hitler instructed Baron Strucker to capture the Howling Commandos, which led him to create the Blitzkrieg Squad. (Dr. Strange II#51) - During a time-travel visit to World War II, Dr. Strange's astral form encountered Hitler in Berlin, as he determined Hitler's connection to Krowler. (Sgt. Fury and his Howling Commandos#24) - Hitler directed a Bundist operation to steal plans and materials from the Manhattan Project. When he learned that the Howlers had run across the operation--and been captured--he demanded that they be shot immediately. The Bundists tried to carry out his orders, but the Howlers broke free and foiled the operation. (Sgt. Fury and his Howling Commandos#28) - Disappointed by Baron Strucker for his many failures, Hitler gave him another chance, assigning him to the French town of Cherbeaux, where the French Resistance was operating. Hitler ordered Strucker to either put an end to the resistance, or put the entire town's population to death. Strucker disliked his orders, and Hitler became increasingly convinced that Strucker would betray him, despite the attempts of Goering and Goebbels to reassure him. When resistance operations continued, Hitler ordered Strucker to level the entire town. (Sgt. Fury and his Howling Commandos#29) - Hitler declared Baron Strucker a traitor after he disobeyed orders in a personal vendetta against Sgt. Fury. He promised to pin a medal on the Nazi who could assassinate him. 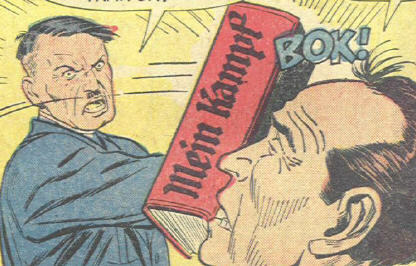 He also smacked one of his assistants over the head with a copy of "Mein Kampf" after he had revealed Strucker's actions. (Invaders I#32-33) - Hitler was approached by Dr. Olsen and his aide (actually a time-traveling Dr. Doom) who used a device to bring the Asgardian thunder god Thor to Earth. Hitler was quite impressed with Thor and convinced him to serve the Third Reich, claiming they were of the same people. Thor fought for Germany for a time, but he eventually came to realize his mistake, finding Hitler to be truly evil, and returned to Asgard. (Sgt. Fury and his Howling Commandos#32) - Learning that Dr. Daneeka had proceeded with their plan to undo the Howling Commandos by brainwashing member Izzy Cohen, Hitler sent Colonel Schleicher to oversee their execution. However, Cohen overcame the effects of the brainwashing, and the Commandos escaped. (Sgt. Fury and his Howling Commandos#35) - Hitler was presented with captured members of the Howling Commandos in Berlin, and decided to make an event of it, even broadcasting their execution on radio. Secretly, Hitler had hoped this would draw out the Howlers' leader, Nick Fury, and it did, but before Hitler could proceed with the execution, Fury's ally Bull McGiveney attacked. Fury nearly captured Hitler, who claimed to be another one of his doubles, but Fury was forced to let him go in the ensuing battle. (Sgt. Fury and his Howling Commandos#41) - Hitler supervised the plans--involving Nina Bergson--to kill both Winston Churchill and the Howling Commandos. He placed Colonel Klaue in charge of the Blitzkrieg Squad and sent them to perform the assassinations. Bergson had been sent to seduce Howler Dino Manelli, but she fell in love with him, and sacrificed herself to save Churchill. In the process, she exposed the Nazis' plans, giving the Howlers a chance to foil them and defeat the Blitzkrieg Squad. (Sgt. Fury and his Howling Commandos#48) - Hitler received a transmission from Colonel Klaue, who had invaded the base where the Howling Commandos were stationed, and overran it with the Blitzkrieg Squad and other soldiers. Hitler had hoped Klaue would kill Fury, but Klaue was unsuccessful, and was captured. (Sgt. Fury and his Howling Commandos#51) - Hitler ordered Jorgen Kline to attempt to assasintate Stalin, but he was thwarted by the Howling Commandos. (Sgt. Fury and his Howling Commandos#53) - Hitler received word that Otto Froebe, one of his most valued military strategists had been captured by the Howling Commandos. He determined that from that point on, he alone would be responsible for the strategies of his soldiers. (Sgt. Fury and his Howling Commandos#57) - Hitler learnt that Captain Schnitzler, head of one of his P.O.W. camps had taken the Howling Commandos prisoner; when the Commandos escaped, Hitler ordered Schnitzler's execution. (Sgt. Fury and his Howling Commandos#58) - Hitler sent the Man of 1000 Faces on a mission to destroy the Howlers. (Sgt. Fury and his Howling Commandos#59) - When Colonel Klaue at last returned to Berlin, Hitler at first wanted him killed, but Klaue revealed he had a new plan to defeat the Howlers, and Hitler approved of it. (Sgt. Fury and his Howling Commandos#65 - BTS, 66, 67) - Eric Koenig apparently switched loyalties, siding with the Nazis against the Howling Commandos and the Allies. Koenig, working with Frau Heinz, captured Sgt. Fury and brought him before Hitler for execution. Hitler told Fury that he would allow him to live if Fury admitted that the Allies were in the wrong, and that the Nazis truly were the Master Race. Fury responded by pasting him one, right in the jaw. Hitler lined Fury up in front of a firing squad, but an assault by American aircraft saved Fury's life, allowing him to escape. Fury met up with Coral Liebowitz, part of the German Underground, who sought to capture Hitler. Hitler ordered the capture of Fury, to no avail. Later, at the house of Oscar Freund, an ally of the Resistance, Fury had a clear shot at Hitler, and decided to take it. However, Bull McGivney suddenly burst in--as part of an effort to rescue Fury--and caused a distraction allowing Hitler to escape. Fury returned to the US, and it was learned that Koenig maintained an alliance with the German Underground and his lover, Coral Liebowitz. (Marvel Mystery Comics#41/2) - Hitler was frustrated with the constant defeats his forces had met against the Sub-Mariner, and took it out on Goering and Goebbels. He then commanded Admiral Von Roeder to defeat the Sub-Mariner. Von Roeder employed giant robots to attack Atlantis, but all of his forces were killed by the Sub-Mariner armies. (Marvel Mystery Comics#42/2) - Hitler read in the newspaper about the disastrous volcanoes which had been destroying navy vessels at sea. He was pleased that at this time, no one was aware the volcanoes were artificial, created by his scientists. However, the volcanoes were finally put to an end by the Sub-Mariner. (Kid Komics I#2/1) - The day after the bombing of Pearl Harbor, Adolf Hitler called in prominent Nazi party member and psychiatrist Dwarf and ordered him to the United States where he set up shop in an old, abandoned house near Washington D.C. Taking plenty of time to prepare for the mission at hand. Captain Wonder and Tim Mulrooney took him out. (Human Torch Comics#12/2) - Adolf Hitler personally ordered the death of Russian sniper Sonya Petroya for killing a Nazi Marshall in Pograd. He sent the Rabbit after her during her visit to the US, but he was thwarted by the Human Torch (Jim Hammond) and Toro. (Marvel Age#109 (fb)) - In order to destroy the morale of the US, Hitler had Santa Claus captured in December 1943. Roosevelt described this situation to Captain America. Bucky, Captain America, and Nick Fury managed to locate Hitler, with a mauser held to his head by Hitler. (Captain America Comics#31/1) - Hitler's scientists created a bioweapon in the form of man-monster Fungi, which released green mist over America's farm crops to ruin them. Hitler had it tested, but Cap and Bucky soon destroyed the creature. (All-Winners Comics#11/5) - The Destroyer discovered that the real Adolf Hitler was, in fact, hidden away; all his public appearances had been made by doubles, because he had been overcome by his guilty conscience. (Human Torch Comics#14/5) - Hitler ordered the Cobra to sink the submarine Cobra had lured Stalin, Roosevelt and Churchill on, but Namor thwarted him. (Human Torch Comics#15/1) - Hitler ordered the Brain, secretly US Senator Doaks turned traitor, to begin a campaign of sabotage. He fell to his death fighting the Human Torch and Toro at an industrial plant planned to destroy. (Sgt. Fury and his Howling Commandos Annual#2) - On June 5-6, 1944-- "D-Day", Hitler was warned about the impending allied assault on Fortress Europa, but ignored it, believing that the base was impregnable. Instead he attempted to order the immediate execution of the Howlers, who had been captured by the Nazis. However, his order came too late, and they escaped and fought their way out. Later, with the allied assault imminent--but the location of the assault uncertain, the Fuehrer told his military advisors that he wished to see what developed, and he then went to bed. (Combat Kelly#26/4 (fb) ) - In July, 1944, Combat Kelly and his pal Cookie Novak were behind enemy lines, where they blew up one of the Nazis' first jets on a secret airfield. But they were captured and were put in a command car under special guard. When a staff car approached from the other direction on the road, they grabbed the steering wheel and forced the car to run the staff car off the road. After fighting off the Nazi guards, Kelly and Novak comandeered the staff car and found Hitler hiding in the back seat. Putting on some Nazi uniforms, the two drove Hitler around northern Italy at gunpoint to secret weapon sites and forced him to order the destruction of all weapons. Afterwards, Combat Kelly and Cookie shaved off Hitler's mustache with a knife and dressed him in Cookie's fatigues. Hitler began to shout ("Ach! You butcher! You fiend! The League of Nations shall hear of this atrocity! "), which attracted the attention of some Nazi officers who didn't recognize their fuehrer and thought him to be an insane American prisoner. Hitler continued to rave ("I AM HITLER! Give me some wallpaper to hang and I will prove it!"). As Combat Kelly and Cookie drove off, Cookie looked at the bright side -- they destroyed all the weapon sites, and even if they didn't bring Hitler in, they drove him batty; Combat Kelly remarked "I hope we drove him batty enough to have him blow his own brains out someday..."
(Captain America Comics#39/5) - Hitler commiserated with Nazi scientist Carl Von Brummel over the latter's failure to develop a "Big Bertha Rocket-Gun" in order to bomb New York directly from Germany; "Der shells only drop in der Atlantic Ocean!" moaned Von Brummel. However, Von Brummel then began contemplating "Master Plan#2," and Hitler eagerly advised him to pursue it. A month later, a specially designed German submarine bombed an American coastal city with rocket shells while submerged; unable to detect the source of the shells, Americans were led to believe that Germany had indeed developed the long-range gun that Von Brummel had planned. Fortunately, Captain America and Bucky were able to locate and destroy the submarine, revealing the truth. (Captain America Comics#40/3) - An assistant lighthouse keeper, calling himself "the Keeper of the Flash," offered to sell the highest-bidding nation a meteor fragment which, when exposed to the sun's rays, emitted an energy beam capable of destroying stone and metal within seconds. In Berlin, Hitler, Herman Goering, and Josef Goebbels contemplated the power of such a weapon; "Ve buy it---und ven ve haff it, ve take back der money---Ya!" declared Hitler. When Goebbels reported that Japan insisted on having separate representation at the auction, Hitler decided to send an additional representative, not known to be a German operative, in order to undercut the Japanese and guarantee the fragment's power solely for Germany. Hitler then ordered agents to be sent to assassinate Captain America, lest he interfere with the proceedings. Captain America and Bucky evaded the efforts but were subsequently captured, and the two heroes were in the custody of German agents when representatives from both Axis and Allied nations converged at the auction site. Violence erupted, and the heroes broke free; a German agent stabbed the Keeper of the Flash, and Cap took custody of the meteor fragment, sending the Axis representatives fleeing in panic. Under an American general's orders, Cap used the fragment to destroy the larger meteor from which it was broken, and Bucky hurled the fragment into the sea so that its power could not be misused. (Marvel Mystery Comics#58/1) - While the Americans attacked Berlin Hitler ordered to steal Peter Riker's formula for a new explosive and destroy the plant producing it. (Kid Komics I#5/1) - Hitler met with Goering and Himmler and ordered to initiatie Master Plan 487B to stop the allies, sending tanks to the Western Front and blowing up a dam. It was prevented by the Destroyer. Hitler, Goering and Himmler had no further Master Plans. (Spider-Woman I#42 (fb) - BTS) - In the winter of 1944 Hitler ordered to take an all black American Air Force Fighter Squadron, which was taken prisoner by the Nazis, to the Red Skull for his experiments in biochemical welfare. The only success of these experiments was Judas Man. (Super-Villain Team-Up#17 (fb)) - In early 1945, Hitler was approached by Arnim Zola, a bio-engineer with theories regarding the transferal of a mind into a new body. Hitler was intrigued, and had himself submitted to machines which would allow his mind to be transferred into a new body upon his death. (Fury#1 (fb)) - Hitler visited Arnim Zola and the Red Skull. Zola gave the Red Skull a potion to take that will place him in suspended animation, while Zola pointed to a cloned body he had prepared for Hitler to transfer his mind into. (War Comics#30) - Early March, 1945 After Berlin underwent frequent bombing by the Allies, an enraged Hitler declared that all Allied airmen held prisoner would face execution. One of his general objected, but (predictably), Hitler did not relent. (Captain America Comics#49/1) - Hitler became desperate to ensure a soft peace for Germany in order to gain time to build up for the next war so he recruited German troops who looked like dead Americans and deliberately had them maimed and left near American lines. The men were sent home to become a Fifth Column preaching race hatred, down with democracy, and a soft peace. After Cap defeated the cripples, he gave a speech against such evils. (Captain America Annual#13 (fb)) - That April, Hitler sensed that the end was near. Having already set up his "Sleeper" robot program, he turned over to the Red Skull a strongbox to be concealed, claiming it was his "final secret." Decades later, the Red Skull finally opened the strongbox, only to find a manuscript of "Mein Kampf," watercolor miniatures, architectural drawings, his Iron Cross from World War I, and anti-Semitic traits that had influenced him-- what he wanted the world to remember him for. (Young Men#24 (fb)/Saga of the Original Human Torch#3) - That same evening, Hitler was cornered in his bunker by the Human Torch and Toro, shortly after Eva Braun had committed suicide. Before Hitler could follow her, he was set aflame by the torches to prevent him from setting off a bomb; he told a loyal follower of his nearby to tell the world he had committed suicide, then died. (Fantastic Four III#53 (fb)) - Hitler's death was secretly observed by a member of the Hidden Ones. (Howard the Duck II#4 (fb)) - His body was examined by his dentist, who stole Hitler's dentures, and would later become Dr. Reich, wearing Hitler's dentures. (Adventures into Weird Worlds#21/2) <August 1953> - In "Hell," Hitler bargained with a contemptuous devil to be allowed to escape his punishment and was given the chance to find someone who would vouch for his worthiness. Deciding not to try his luck among the living, Hitler instead traveled through "Hell" in search of a character reference; thinking that past would-be world conquerors might help him, he approached Alexander the Great, Julius Caesar, and Napoleon, but all were disgusted by his career and refused. Hitler finally decided to seek the support of "Joe," an ally of his who had died a few months ago, only to learn that Joe was now none other than the taunting devil who offered him the doomed deal in the first place. (Uncanny Tales#17/4) <February 1954> - Soviet leader Stalin replaced Adolf Hitler as "lieutenant-in-charge-of-torture-operations" in Hell. (Super-Villain Team-Up#17 (fb)) - Hitler's consciousness arrived in the waiting brain Zola had prepared for him, and was finally given a new body. Hitler then took up the identity of the Hate-Monger. (Thor I#205) - In Mephisto's Hell Hitler, one of the many damned souls in Mephisto's realm, was eager to prove himself to Mephisto and led an army of undead soldiers against Thor in Mephisto's name. Thor defeated them only to be attacked by other damned souls. (Hell's Angel#3) - A soul fragment of Hitler was seen in the "Dead Zone" (a side realm of Mephisto's Hell). (Wolverine/Punisher II#4 - BTS) - A man named Gottlieb claimed to be Hitler's son. He stated that Hitler was the founder of Erewhon, a safehaven for criminals, starting it after World War II. (Wolverine/Punisher II#5 - BTS) - Gottlieb pointed to a mummified body that he claimed was Hitler's. He asked Wolverine and the Punisher to help protect Hitler's body, but enraged townspeople broke in and one threw a firebomb at it. Gottlieb ran to the body instictively, only to catch fire himself. Comments: Adapted by Jack Kirby and Joe Simon. A soul fragment of Hitler was seen in Mephisto's Dead Zone, which means to me that a portion of his soul might have been split off or replicated during his near-death experience. This type of deal might go a long way towards explaining all of the characters who show up in the realm of the dead, but are later revealed to have never died at all--Snood. Perhaps that's actually Hans Klauber (Strange Tales I#10) who appears in those "Hitler in Hell" stories. Perhaps this "suicide" was staged shortly after Hitler's immolation by the Torch, using a duplicate body created by geneticist Arnim Zola, so that the egotistical Führer could have the "death" he wanted. John McDonagh argues that Hitler wouldn't go to Hell since "salvation (in Pauline theology) is based on faith, not upon the humanity of one's actions," but I don't think that sort of argument holds any water in the Marvel Universe--Snood. In a flashback from Captain America I#211, Zola claims to have preserved Hitler's brain and transferred it into the body of "Nazi X", which ignores the entire Hate-Monger storyline. Super-Villain Team-Up#17 does its best to reconcile them, by having "Nazi X" as just one of Hitler's many clonal bodies. Fred Van Lente's Taskmaster (2010-2011) series hit on the topic of cloned Hitler brains. Horst Gorscht, the developer of the Nazis' corrupted Super-Soldier serum resulting in the likes of Master Man and Warrior Woman, stockpiled cloned Hitler brains in Wewelsburg II, a castle in the Bolivian Andes. Using the brains Gorscht created a serum that could unlock the mind's potential by absorbing knowledge instantaneously, which turned a S.H.I.E.L.D. agent into the Taskmaster. The scene from Spider-Man: Fear Itself served as the prologue to the story of the Baroness, who was originally portrayed as Heinrich Zemo reincarnated in a female body, presumably via the work of Zola, similar to how Hitler became the Hate-Monger. Later stories made it appear that the Baroness only posed as Zemo, calling into question that flashback. Anyway, you can find out more about the Baroness if'n yez wants. In the graphic novel The Shadow: Hitler's Astrologer, The Shadow managed to recruit the astrology expert Gretchen Baur as an agent. Working with her, he managed to hypnotize Hitler's superstitious deputy Rudolf Hess into fulfilling their plans: namely, Hess, on April 30, 1941, persuaded Adolf Hitler that he must go against his general's advice and attack the Soviet Union, despite the fact that would entail a two-front war, despite the serious difficulty that would entail, as well as representing a breach of the Molotov-von Ribbentrop non-aggression pack between the Third Reich and the Soviet Union. Hitler presented Baur with a framed picture of himself for her father. Pursuant to the plan to attack the Soviet Union, Hess (either with or without Hitler's permission) commandeered a plane and flew to Scotland on May 10, 1941. He approached the British government with bizarre stories of astrologically predicted victory for the Third Reich and an offer of peace between Britain and Germany. Due to Hess' status as Hitler's deputy, the Soviet Union assumed Hitler authorized his flight to Britain. Afraid of a truce between the U.K. and the Third Reich, Stalin mobilized his armies-which further prompted an attack by the Third Reich on the Soviet Union. On June 22, 1941, Hitler launched Operation Barbarrosa, a massive attack on the Soviet Union. All of this fit the Shadow's plans, as he knew that the U.K. could not withstand an attack by the Third Reich due to the U.S. having not entered the war, so he manipulated Hitler into attacking the Soviet Union. The Shadow had discovered that the Soviet Union had planted an agent called Ivan Fedorovich Volko, whose job was to manipulate Hitler into attacking Britain; the Soviet Union would use the time that Hitler's trying to smash the U.K. would afford them to arm itself and attack the Third Reich, effectively conquering most of Europe. In The 'Nam#14 (fb) - At the time of the invasion of Normandy, the Third Reich, anxious to defeat the Allies, stumbled upon a bizarre plan. An Axis agent (possibly Japanese) got hold of a pack of Luck Strikes carelessly discarded by an American soldier. The cigarettes were rushed back to Germany. German scientists worked hard to replicate the tobacco and paper. They managed to make a flawless copy. The duplicate cigarettes were presented to a Hitler during a demonstration. A captured Allied soldier was given the ersatz cigarettes to smoke-and died as a result. The counterfeit cigarettes were poisonous. The Third Reich intended to disseminate the lethal cigarettes clandestinely among the Allied soldiers. So, a U-Boat (U-27) was sent to England to carry them. However, luckily at that time an Allied B-17 had turned back from a raid on peenemunde due to instrument trouble. The B-17 detected the U-Boat, and bombed it. Per Degaton notes: The idea that the Third Reich somehow represented a return to Odinist thought occasionally crops up-such as in the book The Other Victims: Non-Jewish Victims of the Holocaust by Ina R. Freidman, and probably inspired Roy Thomas' use of Thor in Invaders-but such an idea does not withstand historical scrutiny. I'll observe here that Hitler's admiration for the Norse legends and Richard Wagner's Nibelungen is well-documented, and should simply not be mistaken for his own religious beliefs...and I don't see that Marvel have made any such claims. Big thanks to Scott Martin for his assistance on Captain America Comics#2, and to the Spirit of '76 for Human Torch Comics#5! From Ronald Byrd: In Daring Mystery Comics#8/6, during 1942, Hitler met with Herman Goering, Josef Goebbels, and a Nazi scientist named Von Schalz who had perfected "a special chemical ice which induced deep slumber, causing all living processes to be suspended. Hitler, perturbed at the war's present development, concluded that "Germany is doomed" and decided that the four of them should enter a state of suspended animation for 1109 years, with the plan to use the captured wealth of "all the conquered nations" to conquer the world after their revival. "A hidden cave, deep in the Black Forests of Germany," was selected as the site of their rest; the four hid their wealth in the cave and plunged into a pool of Schalz's chemical, freezing themselves for over a millennium. In the year 3049, the hidden cave's entrance was discovered and opened by unknown parties, and the four Nazis emerged from their 1109 years of sleep. Hitler and his aides then set about bribing soldiers to serve them and making their plans to conquer Earth and, eventually, the rest of the universe. In 3050, three months after their awakening, Hitler, Goebbels, and Von Schalz used a rocket ship to bomb the Congressional Building in Washington, DC, where a permanent peace between "war-wearied nations" had just been finalized. The heroic Captain Daring, leader of the forces of democracy, ordered his fleet to bring down the attacker; the rocket ship was shot out of the sky by Daring's fleet, and the three Nazis parachuted to safety. Daring landed near them and confronted them, surprised at the appearance of "the mad dictator of 1941." Stalling for time, Hitler explained to Daring how he and his men had survived into the thirty-first century. Just as Daring wondered aloud where Goering was, Goering, having led a troop of bribed soldiers into the area, struck him from behind. Von Schalz then placed Captain Daring under a hypnotic spell so that his knowledge of thirty-first century military strategy could be of use to the Nazis. "The time is right for the greatest blitzkrieg of all eternity!" declared Hitler. "The forces of democracy have gone soft with peace! Captain Daring will lead our armies to victory! Heil Hitler!" Millions more soldiers flocked to Hitler's banner for "promises of wealth, power and glory"; Goebbels used the Telecast News United communication system to start a propaganda campaign, while the mesmerized Captain Daring took command of Hitler's armies and directed "the first army of occupation [to] establish a camp in the northwestern territory." No information is available on how this situation was resolved. From The Continental Op: Another possible appearance of Hitler is in MARVEL TREASURY SPECIAL#1 (Captain America's Bicentennial Battles). The Contemplator sends Captain America back in time to World War II, where he rescues Bucky from being interrogated by Hitler, the Red Skull and some Nazi officers. The story doesn't make it clear whether Cap meets the real Hitler, an alternate universe Hitler, or an illusion of the past. At some point Hitler gave a cigarette holder to Wolfgang von Strucker as revealed in Skrull Kill Krew#3. Thanks to Per Degaton for pointing out Hitler's Men's Adventure#23/2 appearance. He also noted that in real-life, (Adolf) Hitler was never called Schikelgruber (though his father was) and that he was never a paperhanger. I placed the Men's Adventure appearance before the first Dr. Strange flashback because I think that somebody like Heinrich Krowler wouldn't have shown any interest in Hitler before he gained the coin. John McDonagh: It does not fit into the Earth-616 history as it took place after Goebbels had killed his family (Goebbel's corpse was shown in a panel) and took place on April 30, 1945, in the bunker, with Eva Braun. John McDonagh caught the appearance in War Comics#30 (reprinted in War is Hell#6) and Marvel Age#109. I guess what could have happened was that Hitler had Gottlieb after he entered the clone body Zola prepared for him. Since thanks to the timescale, the lacunae between Hitler's death (in his original body) and his first recorded public appearance as the Hate-Monger in FF I#21 now stands as at least a period of 45 years (1990-1945), and since Arnim Zola works in South America, this could work. In Uncanny Tales#17 Hitler was replaced in a job as chief torturer by Stalin. This tells me that he had been sent to Mephisto's Hell because there Stalin had been for years until Satannish stole his soul to turn him into Coldsteel. In Marvel Mystery Comics#34 writer Carl Burgos saw his own creations Human Torch and Toro spring to life from his drawing board and give him the idea for a comic to mock Hitler. In the story Torch and Toro guarded the comic books from Nazi attempts to destroy them as they are distributed them from planes to German citizens. Hitler ordered anyone who laughed at the comics to be shot and demanded Carl Burgos to be assassinated. Carl met with Torch, Toro and Sub-Mariner at a diner where a Nazi agent had replaced the soda jerk. Carl collapsed after drinking the soda. Torch and Toro apprehended the spy and Carl recovered. In Rugged Action#4 (June, 1955) a man claimed to have killed Hitler long before he actually died. This was most likely a doppelganger. Captain America/Black Panther: Flags of Our Fathers#1-4 (June-September, 2010) is a nice series by Reginald Hudlin, but it does not work within Marvel's continuity for a few reasons. Hitler appeared in #1. Deadpool IV#26 (May, 2014) is a time travel flashback story and shows Hitler travelling through time to kill Nick Fury. Deadpool and Cable not only save Fury from this time travelling Hitler, but also kill him. This version of Hitler most likely came from another reality...maybe the whole story took place in another reality. The story in Battle#17 is a flashback story leading through the start of World War II until its end. Thanks to John Kaminski for adding Hitler's appearances in Combat Kelly#26/4 & Uncanny Tales#17. Thanks to Monzo for the scan of Hitler's death at the hands of the Human Torch (Jim Hammond). Thanks to Markus Raymond for adding Red Skull, Namor 70th Anniversary and with the help from GCD many missing Golden Age appearances. There are still tons of Hitler appearances from the Atlas era that I know I'm missing, including Battle#18, 26, 28, 30, Justice#20, 34, War Comics#24, 25, 28, 30, Battlefront#13, 19, 20, Battlefield#2. If you can provide a summary of Hitler's appearances, I'd be most appreciative! Thanks to Jordan Brodie for pointing out the "Father" of Erowhen alias.